Cox in the 2004 summer Olympics in Athens, Greece. Cox, who ran in the preliminaries of the 4x400 metre relay, admitted to taking an anabolic steriod. 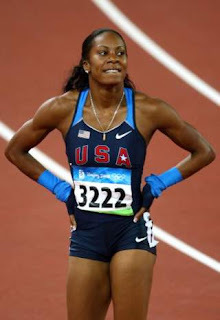 While she will lose her medal, the fate of the Richards, Dee Dee Trotter, Monique Henderson and Monique Hannegan who ran in the finals are not yet known.Marion Jones' teammates were stripped of their gold medals won in the Sydney, Australia 2000 Olympic, but are fighting in the Court of Arbitration for Sports to have them restored. Jamaica had finished third in the relay.